The best treatment options for very severe nodulocystic type of acne include systemic medications, surgical interventions and combined topical therapies. Very severe acne comprises of numerous pustules, deep fluctuant nodules and cysts on the face, chest, back, and at times, on the buttocks, groin and armpits. The main concern of treating this grade 4 nodulocystic acne is prevention of scarring, which is present in more than 90% of affected individuals. 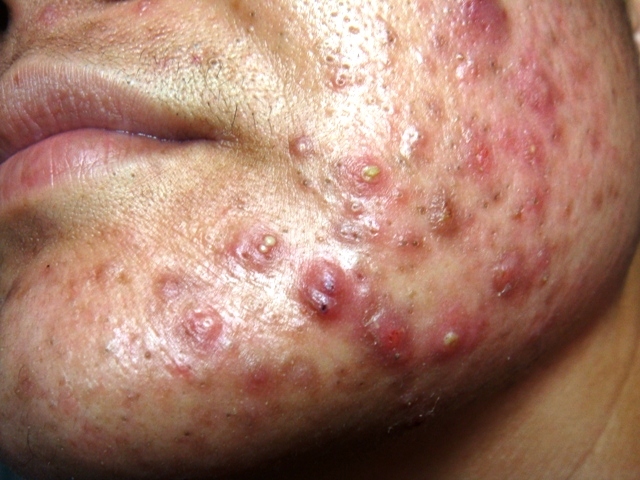 The best medication available for very severe nodulocystic acne is oral isotretinoin. The dosage is 0.5 to 1 mg per kg body weight per day as a single dose. As isotretinoin is teratogenic (causes birth deformities), women of child bearing age group should avoid this medication unless absolutely necessary. Pregnancy should be avoided during and two months after treatment with isotretinoin. All patients should be aware of side effects of isotretinoin and how to avoid them. Initiate therapy with Minocycline 100 mg twice a day with topical application of either Benzoyl peroxide 5% or topical tretinoin 0.05% at night. Deep seated nodules and cysts should be drained to enhance the therapeutic effects of the antibiotics and aid the healing. Intralesional triamcinolone injection at a strength of 5mg/ml into the nodules hastens the healing process. In explosive cases of nodulocystic acne (known as pyoderma faciale), which is more common in females, a combination of oral steroids and isotretinoin works wonders in clearing the eruptive bumps at a faster rate. After 4-6 weeks, the response to treatment is reassessed. If the nodules and cysts have healed, minocycline is continued at a dose of 100 mg per day for another 4-6 weeks. If there is no recurrence and the acne bumps have healed well, minocycline may be replaced with doxycycline 100 mg daily for another one month and then tapered over a period of 2-4 months. While the oral medications are tapered, add topical clindamycin as morning applications with topical tretinoin replacing benzoyl peroxide as a maintenance therapy. If any recurrence is there, a short course of oral minocycline is repeated. If, after 4-6 weeks of minocycline, the response to treatment is not satisfactory, then the option of oral isotretinoin is explored for the patient. Females with explosive nodulocystic acne, with or without associated increased hair growth (hirsutism), should be investigated for diseases like polycystic ovarian disease. Patients who have been treated satisfactorily should modify their life style and follow the specific tips to prevent recurrence of acne in the future.